About every 2 months another metric ton (or so) of Nirvana’s specialty beads arrive from Jablonec in the Czech Republic. Even though owners Nir Kronenberg and Cynthia Shanti Moralez have the basic process down to a science, the actual arrival of new beads is always an adventure. Nirvana’s “corporate offices” consume all of a small frame house in historic Hudson, New York where preparations to receive a shipment start as soon as word is sent that the order has been completed. With all but one passenger seat permanently stripped from the company’s simple van, Nir knows exactly the formula to puzzle 2,000 to 2,500 pounds of beads into the space, but if the order is larger he rents a U-Haul truck for his run to the arrival airports in New Jersey or New York. 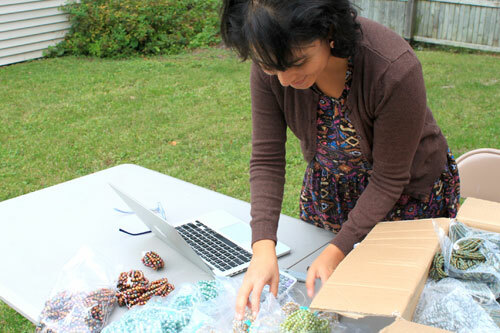 Shanti pulls from her library of comparison strands of reorder items and the entire team steps up to prepare space and all the necessary paperwork for new offerings in the shipment. Anticipation is particularly high for the first look at new designs knowing the just right translation of bead designer Shanti’s requests can mean the next big seller for the family-owned company, but a slight flaw, a misread on color combinations or even the density or placement of the finish can mean a weak seller or even the need to reject the item entirely. Good weather is always a big plus the day after Nir returns with the stock. 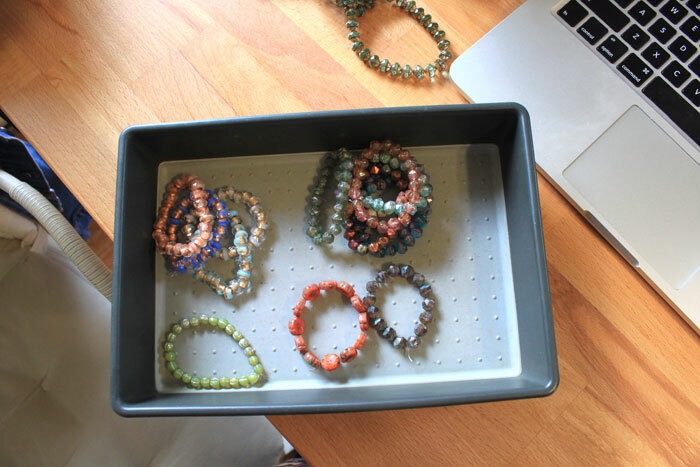 Daylight is the best light to see subtle differences in the beads, so whenever possible tables are set up in the driveway and small yard to open each box and methodically evaluate every hank. The artisan process in Jablonec creates both an exceptional product for Nirvana’s customers — and the “variances” that can come for any of us at the end of a long day. Nir and Shanti need to check the delivery against the order as well as the counts of the strands and integrity of the stringing — but most importantly they are looking for the level of variation on reordered items. Each Czech Glass button is individually forged and any painting on buttons is done by hand — while the molded, facetted and table cut beads are prepared in small batches. The level and placement of finish is remarkably consistent thanks to the many years of experience offered by the Czech artisans Nir and Shanti have come to know over the years — but it is not an automated process. Very subtle changes are unavoidable and larger ones are inevitable. This is where the delicate balance of the role Nir and Shanti have assumed between the artists who make their beads and the artists who use their beads comes into play. They check every reorder against strands of previous deliveries for any change in appearance. If there is a change, a new product SKU will be created with the same inventory number and the addition of a letter (awarded in a-b-c sequence) to show it’s a different version that will be offered as a distinct product online. Sometimes the new version matches up a few generations back and an “a” shipment will come into stock following the previous b, or c.
Only after the review process is complete are the accepted items photographed, cataloged, added to the stock sent to stores and offered to wholesale customers online. Once the entire cycle complete, the best of the online offerings will be introduced in the weekly Nirvana email. As the number artisans in Jablonec continues to shrink, it’s gratifying for Nir and Shanti to unpack the beautiful new work of the people they know and support — but particularly challenging when things go wrong. While it happens rarely, subpar craftsmanship is never acceptable. Sometimes product is returned and if it’s a new problem — the artisan is given the opportunity to make it right. If a quality question continues, the difficult decision must be made to replace the artist or artisan group. It happened recently among the very small pool of Czech Glass button producers and inadequate work from a man they knew and respected for years. Both severing the relationship and paying more for new buttons from others was painful, Nir explained, but is required in the unspoken agreement Nirvana’s long-term customers have with the company. U.S. consumers anxious for a deal are often not aware of the potential consequences and liabilities of buying from overseas sites, especially those which attempt to skirt the rules or understate the obligation the buyer has to report and pay for the goods. Unscrupulous sellers will tell buyers they will understate the value of purchase to save the buyer money, when in fact, it’s the buyer who is ultimately liable for the fines and legal actions of such a misrepresentation. 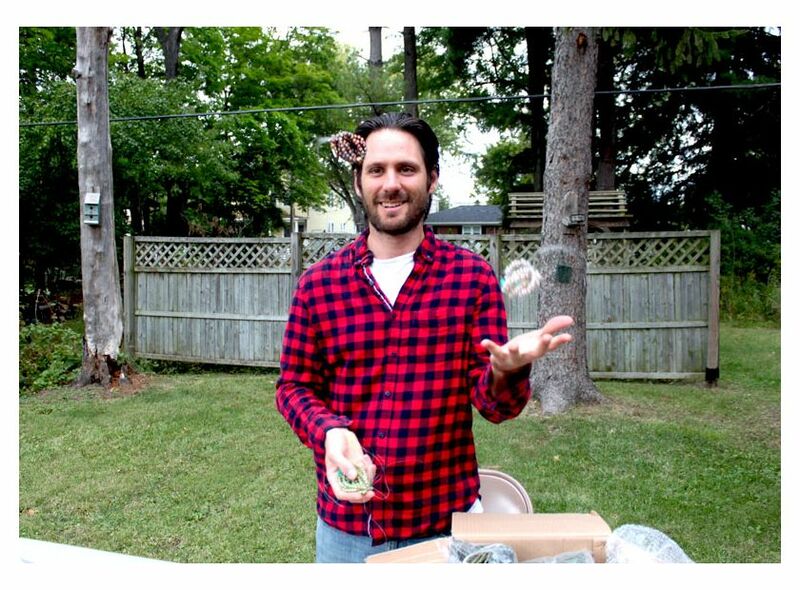 Although Nir’s juggling skills have no literal application to Nirvana’s work, the illusion is obvious. He admits that setting a high standard for quality, financial, legal and market obligations on both sides of the Atlantic can be a great deal of work, but he can’t imagine it any other way. 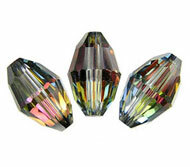 “We sell wholesale beads, buttons and findings, but our most important asset is our customers. They expect much from us and it’s our privilege to deliver,” he said. What does it take find new possibilities in Old World processes? 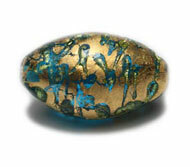 8x12mm Large Hole Roller Bead Champagne with Picasso Finish. 3x5mm Rondelle Tan and Sea Green with a Heavy Picasso Finish.